12/11/2018. 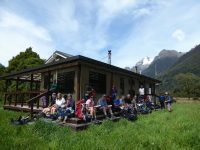 Hollyford Camp. M. Phil. 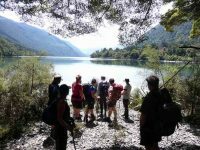 Trampers: 12-16 Nov: Hollyford Camp. M. Phil. Planning to execution seemed to go very well as everyone was at Waihola early….. this being a trait that continued for every start during the week. 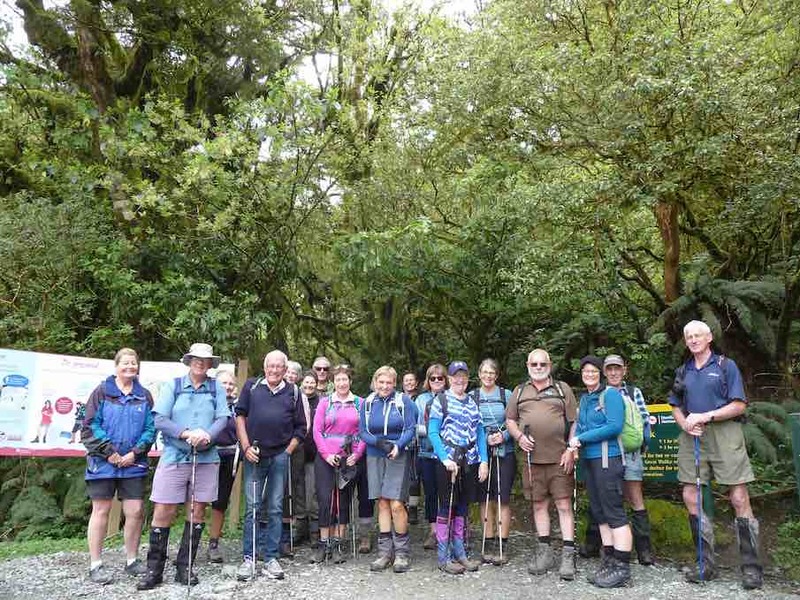 18 intrepid walkers in 6 cars set off and bang on time arrived at Cocoa’s Café at Mandeville airport for a necessary kick start to getting to Te Anau reasonably refreshed. First stop was at the DOC I-site to get hut tickets and check the weather, then it was food and petrol top-ups plus a visit to the best public loos in the world for most – albeit some of us had to go back to the car to get the entry gold coin! 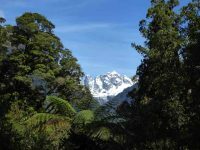 initially via the Routeburn/Greenstone track, before branching off on the zig zags to the Summit and, for some, beyond the well known tourist look out. 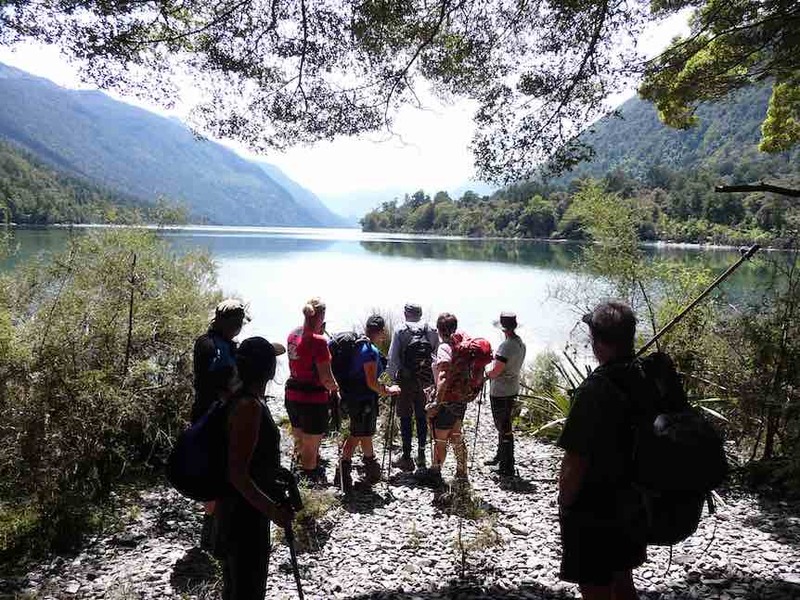 The group split into 3 as each limit was reached; lovely views of Lake Marian, the Darrans, the Hollyford and also the Greenstone Caples were in view and appreciated. We finally descended in good time and once back in the cars, moved into the Hollyford proper. 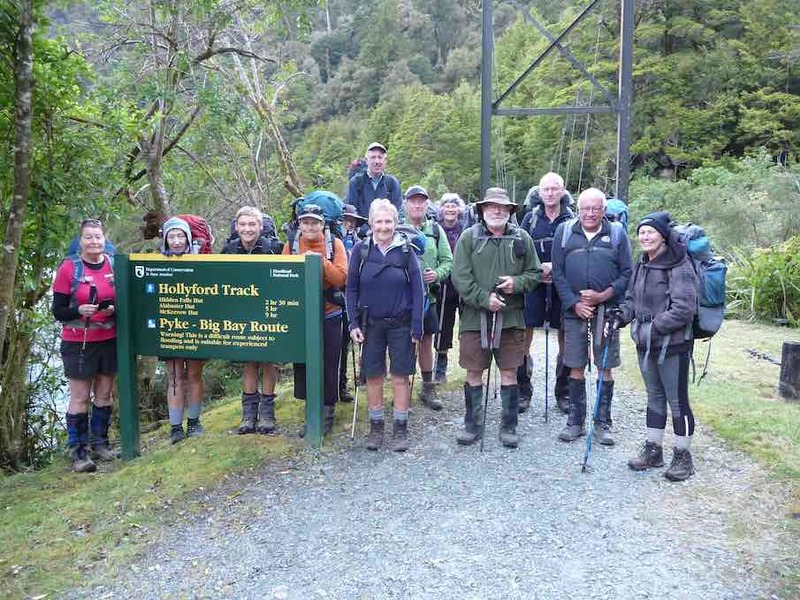 Turning right into the Lower Hollyford Rd we stopped, read and discussed the memorial to Davey Gunn that celebrated his 56 mile journey over bush tracks from Big Bay to the Milford Rd in 23 hours to raise support for the injured in a plane crash there. What the books don’t say is Davey had a cuppa then returned to Big Bay to carry on his guided trip… he had also cracked some ribs getting plane passengers from the crash in the surf…. Finally we arrived at Gunn’s Camp and settled in to our ‘little huts on the Prairie’…… followed by good craic and a variety of well cooked dinners. capped off by some loud avalanches at the top of the valley (they resembled large waterfalls). We stayed here for a good 40 minutes enjoying a very special environment, before returning. 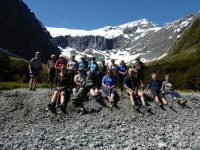 After lunch, having ensured that no-one laid down on their bunk, we travelled up the Upper Hollyford and just before the Homer Tunnel, veered off to park in the Gertrude Valley carpark. 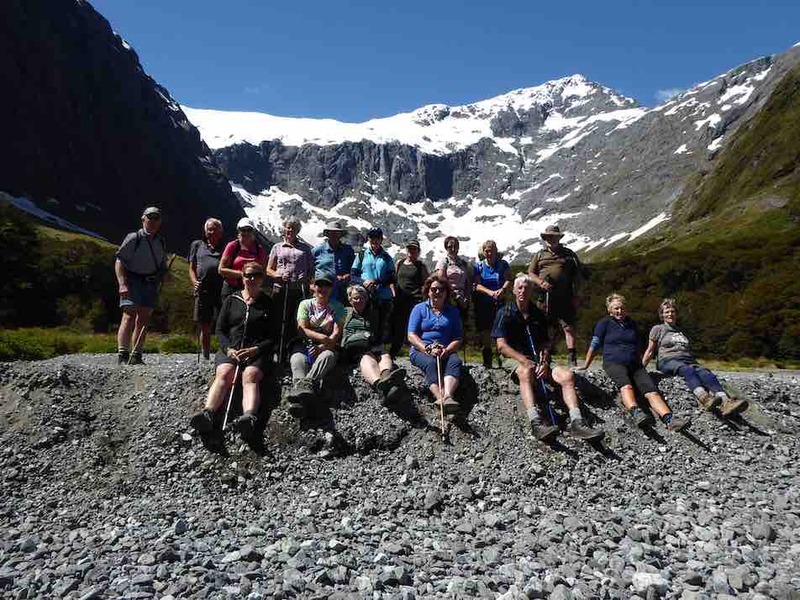 We then rambled a while to the base of the Saddle, enjoying the amphitheatre of surrounding peaks as well as the early celmisias, ourisias and Mt Cook lilies that were smiling back at us. 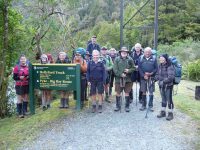 Once back at the cars we returned to Camp, allowing for a short stop at Falls Creek where new carparks and Gantries have ensured another great stop on the Milford Rd. 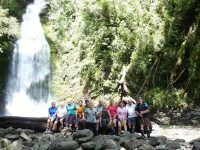 we rambled through forest of Beech, Miro, Matai, Totara, Kamahi and Rimu, finally arriving at Hidden Falls Hut for lunch (having already stopped off at the Hidden Falls to get showered upon). A few green hooded orchids spread throughout the moss and liverwort track edges. 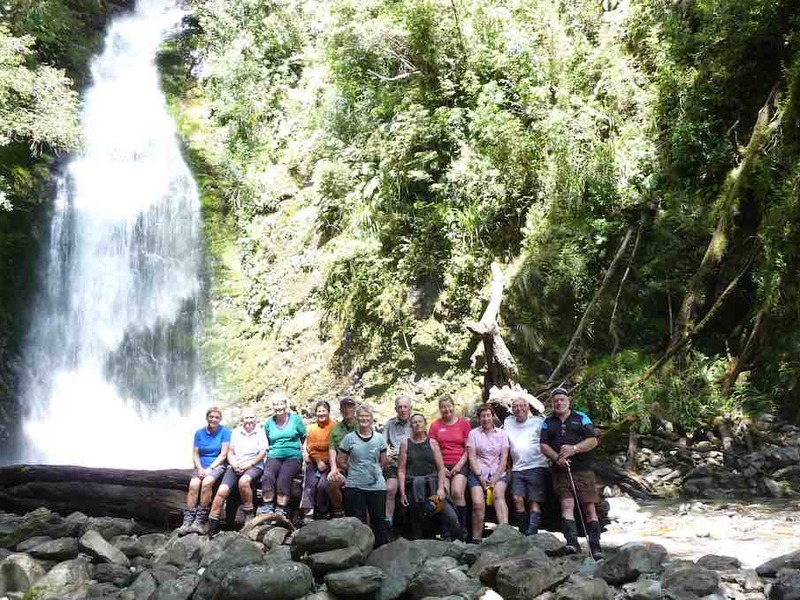 followed with tree falls along the way becoming a little harder to limbo under….. the Falls drew everyone to them and then after a well earned break we set off for Lake Alabaster through self pruning beech forest. As we veered in to the Pyke Valley, we were greeted by tall straight Kahikatea. 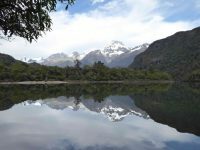 Finally we emerged into a clearing where the Pyke Lodge of the Guided walk stood and gazed upon the majestic view of Mt. Madeline dominating the Hollyford skyline. – 7.5 hours after we started, and according to GPS estimations some 2 kilometres longer than official publications credit, at just on 23 kilometres for the day! interspersed with splashes of delight as keen trampers (some) had a ‘swim’ and dried off before the sand-flies could do damage. A good spread of birdlife was enjoyed along the walks including tui, bellbird, grey warbler, (bush robin at Marian),shining cookoo, ruru (at night! ), chaffinch and the melodious Kaka. Masses of perching orchids (the bamboo – Earina mucronata) adorned tree branches around the shoreline. We had the company of a small number of other trampers for the first night at Alabaster. 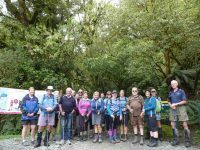 On the Thursday morning, helped by feedback from trampers off the ‘Demon Trail’, 10 decided to follow the dotted lines on the map along side the Lake up the Pyke Valley; this in effect being a bush bash with the lapping levels of the Lake the easier going. About half way along we stopped at a large flowing creek…. fishing and fossicking were undertaken, with not a lot of luck, though style was fine. 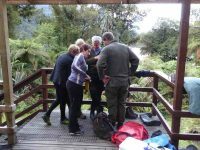 Returning through thick bush we stumbled upon a small ‘grave site’ and then returning to the hut we had a cuppa and lunch, before crossing the largest swing bridge in Fiordland over the Pyke River, to touch upon the Demon Trail. A hundred metres of this was enough to convince us that we should save this for another time…..! 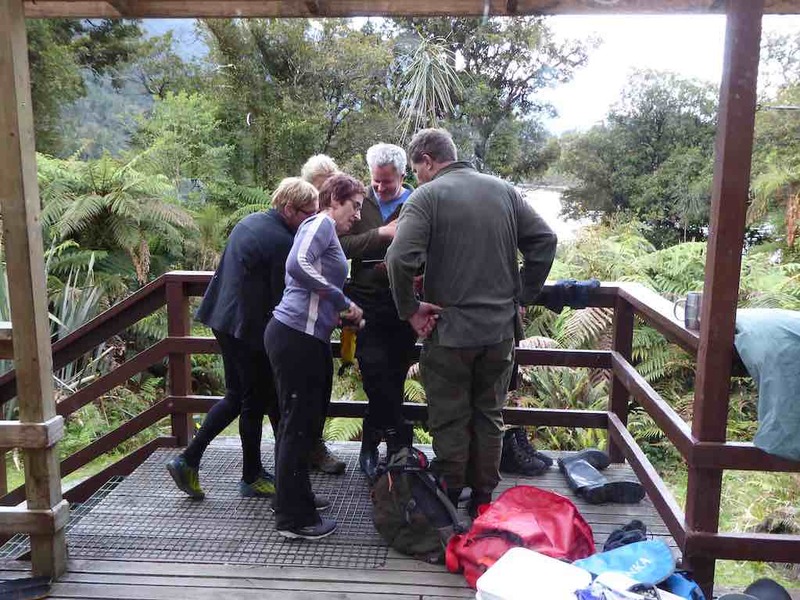 … and pack rafters arriving along with a range of trampers heading up or down the valleys from or to the Coast. Deer had been shot, trout caught, a jet boat sunk and being expensively recovered with helicopters ….so much to catch up on….. and best of all, no news from the outside world! Mattresses were spread throughout the common areas to accommodate all. Notwithstanding the week of walking everyone was up and away at 6.50 am on the last morning, well before the official start time, as a slight rain began to fall…and fall….and fall. 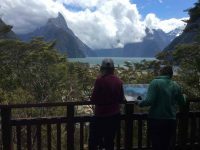 At last we were experiencing a Fiordland shower… becoming so consistent and insistent that when the time came we made a detour to Hidden Falls Hut for an early brunch to recharge, before the last 2 hours trudge to the road end. We took 1.5 hours off the incoming time, very commendable as we were going uphill all the way! (but then apparently the GPS said the distance was shorter…) ah we are better off without these new contraptions! After 6 hours tramping we quickly reorganised before driving to Gunn’s Camp where we checked for final messages from the Hikers, picked up belongings, then drove back to Te Anau and civilisation. 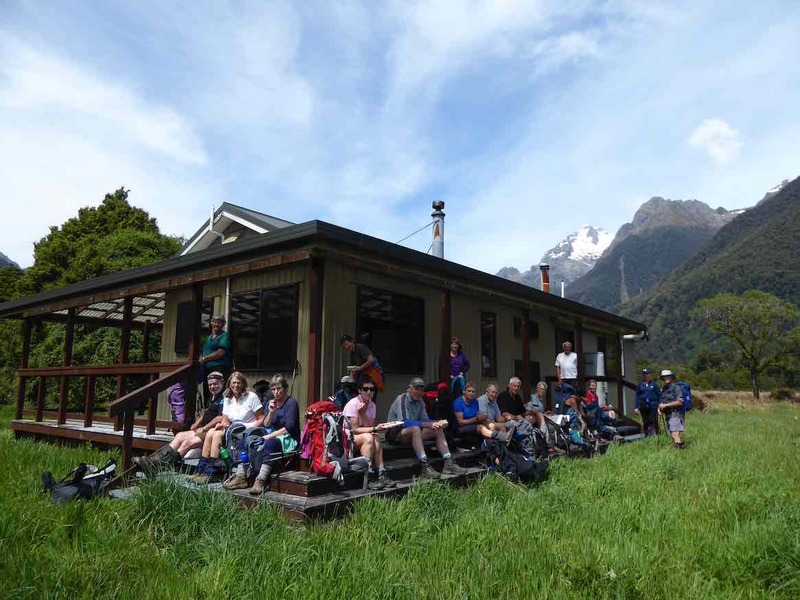 We caught up with the Hikers at a local Café which was being inundated by bus loads of tourists, they were swarming and biting better than sand-flies! The Hikers meantime, had an enjoyable day trip to Milford Sound on the Thursday. First stop was the well known Chasm, and then they made a call into the Milford Sound Lodge. What used to be a backpackers hostel now has several new cabins and areas for motorhomes, all well laid out with the Cleddau River nearby. The coffee wasn’t bad either apparently! 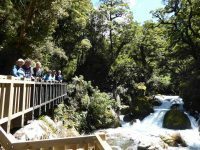 On the way out they made a stop at the historic bridge over the Tutoko River and a lookout near the tunnel entrance. Friday for them dawned with heavy rain so the decision was made to stay put, light the fire and relax in the common room awaiting the trampers return. 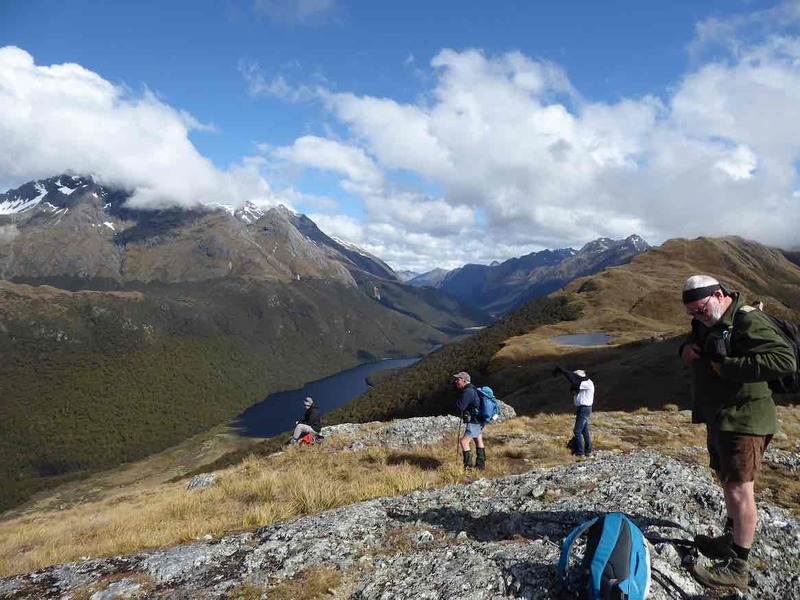 By 1pm they decided to head for Te Anau for lunch and rendezvous there as originally planned. A most enjoyable 5 days of great company, tracks and views to click the camera at. Four days of sunshine out of five is not a bad record in Fiordland terms. Next stop Martins and Big Bays? Everyone felt at home here and the accommodation and facilities most appropriate for a stay. 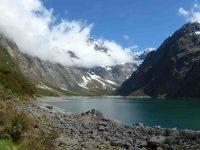 It is a very good base for exploring northern Fiordland, whether sightseeing, fishing, hunting or walking and would save multiple trips to and from Te Anau – or to just step back in pace or in time. Tell me you all got bitten. Thank you Bill, for a Bill McLean classic!